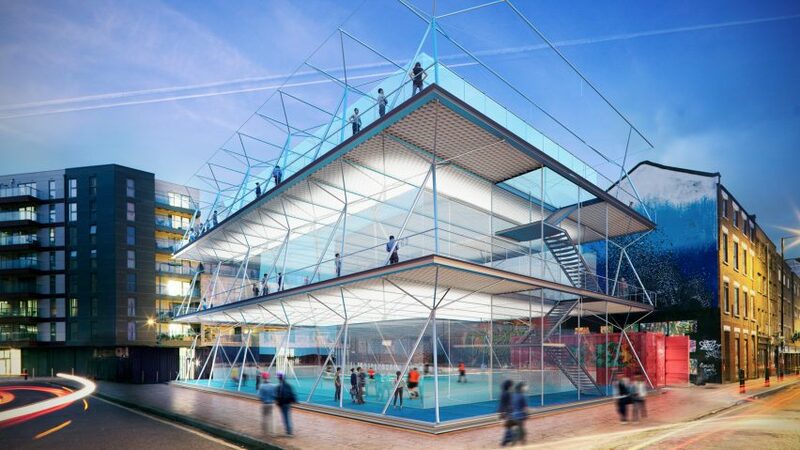 Stackable football pitches could be erected on disused or temporarily empty plots across London, according to Amanda Levete and her London-based studio AL_A. The concept, named Pitch/Pitch, aims to tackle the shortage of inner-city sports fields available in the centre of the UK capital. Designed by AL_A with Arup engineers, the modular system would comprise a lightweight carbon-fibre structure, able to stack five-a-side football pitches one on top of the other. The towers are designed to be quick and easy to install, allowing them to be erected temporarily for events such as World Cup tournaments. "We've designed this intervention to encourage the theatre of the game, with spectators and would-be players drawn in as Pitch/Pitch animates the cityscape," said AL_A director Maximiliano Arrocet. "Pitch/Pitch allows the game to retain an urban flavour, adapting to the number of players and awkward shaped sites." The towers are intended to have a lifespan ranging from just a few days to a year, meaning they could be used to fill sites awaiting development. One such proposed site is the car park of a wine merchant in Shoreditch, east London. But AL_A is currently in discussions to consider how the scheme might be funded and implemented across the city. This wouldn't be the first time the studio has worked with carbon fibre – the architects used the material, more commonly associated with the marine and furniture industries, to create a canopy of translucent petals for the 2015 MPavilion. The application of carbon fibre is becoming increasingly more viable in architecture, as researchers continue to investigate the lifespan of the lightweight and high-strength material. Japanese architects Atelier Bow-Wow claim conceived the first ever building with a carbon fibre structure in New York in 2011, while researchers at the University of Stuttgart have a programme dedicated to testing the material's capabilities. Achim Menges, an architect and researcher at the school, said that tapping the potential of carbon fibre will revolutionise the construction industry, leading to a fourth industrial revolution. Amanda Levete and AL_A placed at number 179 on Dezeen Hot List, our guide to the 400 most-read-about architects, designers and brands of 2016. Among the firm's most recent projects is the MAAT contemporary art museum in Lisbon, which attracted 15,000 visitors to its opening. AL_A is also currently working on a refresh of the Galeries Lafayette department store in Paris and a mosque in Abu Dhabi's World Trade Centre.